If you are looking for beautiful scenery with a bit of culture and history thrown in while on a safari in Uganda, the Ssezibwa falls are the perfect place to visit. These magnificent falls are found just a short distance from Kampala. It is the perfect place to go to get away from the hustle and bustle of the city. Everyone needs a little quiet every now and then. There is the Ssezibwa falls resort close to the falls so you can even spend a night in this serene environment. The ssezibwa falls are most just a waterfall to the Baganda, which is the dominant tribe in central Uganda. The falls are an integral part of their culture, history and traditional belief system. What is the story behind the cultural and traditional significance of the falls? According to the Buganda legend, hundreds of years ago, a woman called Nakangu; from the fox clan was expected to give birth to a set of twins but instead gave birth to two rivers – two streams. Local tradition believes that the spirits of Nakangu’s unborn twins, Ssezibwa and Mobeya still live on and inhabit the waters of the river. From Ssezibwa, two rivers flow past the peaceful Island that separates them into two streams, which is the basis of the legend above and how the rivers came to be. It was customary for Buganda passing by the source of the river to throw stones into the waters for good luck. For many Buganda, the birth of twins is still considered a supernatural occurance of some sort. There have been stories of animal sacrifices and rituals performed when twins are born as a way of honoring the gods or spirits. 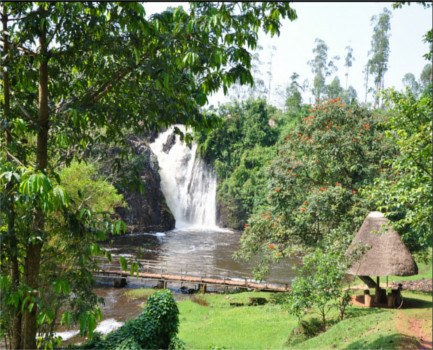 The traditional and cultural aspect of the Ssezibwa falls gives it an air of mystery and adds to its attraction as a getaway destination. Interestingly though, a portion of the Ssezibwa site is run by Church of Uganda, which is the Anglican Church in Uganda. So it is a place for Christians to retreat, and pray and spend some time alone. Water baptism is sometimes done in these waters. All in all, Ssezibwa falls is a serene and beautiful place to visit. The falls are magnificent, the flowing rivers beautiful, and the scenery is breath taking. Its proximity to Kampala makes easily accessible and all the more attractive. The clean air and atmosphere here is such a contrast to the busy and dusty streets of the capital. You can take a hike, a long bike ride in the area, do a little bird watching, enjoy a meal at the resort, and have yourself a peaceful holiday. If you are on safari in Uganda, you can make a stopover visit to these falls on your way to Jinja for a white water rafting adventure.